Harvest. While chopping corn or alfalfa, make sure to get every pound that you can into the truck and into the bunk. Missing a truck with the chopper spout or filling a truck so full that feed blows out during transport are both regular occurrences during corn harvest, but every pound that ends up in the field or on the roadside is a pound that doesn't end up in your cows' bellies. How can you avoid this? 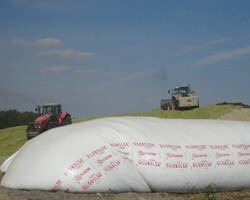 If you are hauling silage an extended distance, consider the use of a truck tarp to avoid too much loss. Make sure that your radios are working well so that the chopper and truck drivers can communicate. If you have someone driving truck that is new or out of practice, take a little extra time to let them get up to speed. Remind your crew at the beginning of harvest of the importance of getting as much forage as posible into the bunk. Storage. You have the greatest opportunity to reduce future spoilage while putting up forages in the bunk. First, remember how dry matter impacts proper packing. Feed that is too dry may not pack well enough to eliminate oxygen, thus leading to poor fermentation. Feed that is too wet can lead to excessive moisture loss due to leaching during fermentation. Covering the forage properly is critical, whether it be with 6-8 mil polyethylene plastic or a combination of plastic and an oxygen barrier. Lining bunk walls can help reduce spoilage around walls and corners and overlapping plastic a good amount when more than one piece are required will also reduce spoilage. Feed Out. Once you have a quality feed fermented in your bunk, do everything possible to feed every last pound of it. When you don't feed off the face fast enough, exposed feed spoils due to oxygen exposure. Remove at least 6 inches per day from the bunk face. Use a defacer to keep the bunk face smooth. Keep driveways and feeding surfaces smooth so that the loader and feed truck operators can minimize spillage.